God's promise is greater than gold, and now you can remind yourself of that with a plain cross pendant from Apples of Gold. This simplistic style still speaks volumes about your faith. The humble style is free of unnecessary embellishments to keep the focus on the cross shape of the pendant. This piece is wrought from high quality 14K yellow gold and carries the traditional style for precious metals. It will be easy to remember the bounty of God's love with this modest design. 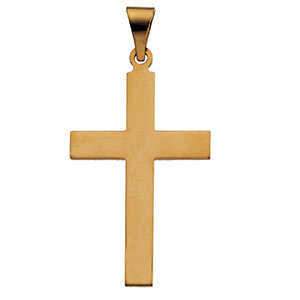 We guarantee our Small Plain Cross Pendant, 14K Yellow Gold to be high quality, authentic jewelry, as described above.